The backing bridges the fly line and the reel, hence it needs knots at both ends. Arbor knot. Thread the backing around the spool. Tie an overhand knot at the end of the backing, wet it (to decrease heat generated by friction) and cinch down. Now, with this end, tie a simple overhand knot around the backing and cinch down. It is o.k. to make 2 turns around the spool when starting out. Now pull slowly the longer end of the backing until the knots are tight against each other on the spool spindle. Trim the tag end. Nail knot is a strong thin connection, that glides reasonably well through the rod guides, when a strong fish takes us into the backing (happy day). We tie a loop onto the backing and loop it to the fly line. Make the loop in the backing large enough for the reel to pass through, making the looping together of the lines much easier. Bimini loop/twist is very strong, but more complicated to tie, but reliable. Used for big fish saltwater pursuit. 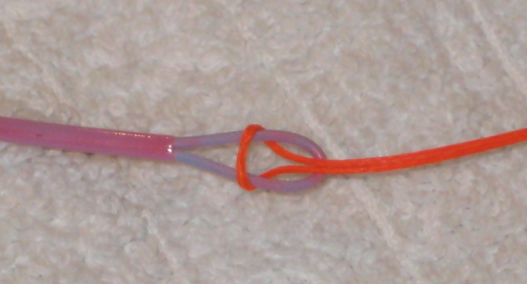 Here is a video of Captain Baz tying a Bimini twist.